Learn how to paint watercolor poppies on the beach beginner | Free eBooks Download - EBOOKEE! In this course we use the HAKE brush mostly,if you are not familiar with this fantastic brush there is a free half hour video in the preview section,here I paint a complete picture using only my HAKE brush. Just 6 color are used,I always use student colors in tubes,these are less than half the price of Artists colors and I find them great,the colors I used here are,Raw sienna,alizarin crimson,burnt sienna,ultramarine and lemon yellow. I always use A three size watercolor card,when buying it look for 140 pound or 300 gsm on the pack,this tells you that it is robust paper and you can put lots of water on it,I use a make called Bockingford. This scene is taken from Pensarn /Llandullas beach which is just about a mile up the road from where I live in North Wales,in mid summer the poppies go absolutely wild and this painting was done earlier this year (2018). I know that when I started off painting in watercolors over 30 years ago one of my biggest problems was knowing what subjects to paint and that is why I have made this series of tutorials for the beginner watercolor artist. Not only do you have this scene ready for you to paint but I also take you step by step right from the beginning and explain in real time videos exactly how to do it,if you have any questions during this tutorial you can ask me via the Q and A. There is a free preview video which tells you what equipment you will need,I make lots of use of a brush called a Hake brush,this fantastic brush is not expensive and there is also a free half hour preview video of this brush which you can watch so you will be up to scratch on it when you go to buy one. The Hake brush I use is a 1 inch size and the average price is about $5 US dollars so as you see it is more than affordable,you will not be disappointed with it I can assure you. We will start off doing a simple sky and background then I will walk you through the middle ground before we come to the subject of the painting which of course is the poppies at the front,I know you are really going to enjoy painting the poppies,everyone does. If you are worried about your drawing ability and think you will not be able to do the little bit of drawing at the start,dont you worry because I have drawn a template and all you need to do is print off the template and I will show you how to use "tracedown paper" which is an artists version of copy paper,this is available at all art supplies shops these days,of course if you enjoy doing freehand drawings you can do your own sketch. But I know from experience that lots of budding watercolor artists are put off because of their lack of drawing skill. By the way,by using the tracedown method you will be surprised at how your drawing skills improve. Stuck for gift ideas this holiday season,paint your own,I cant think of a nicer present than an original watercolor painting. If you want to free yourself up from messing and fiddling with your paintings,these courses are for you,learn to relax and enjoy your hobby. It does seem hard when you are starting off doing watercolor painting,let this course take away that stress and go with the flow. 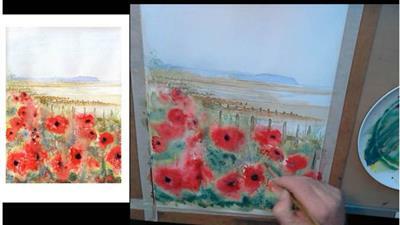 No comments for "Learn how to paint watercolor poppies on the beach beginner".